« It’s summer, but all is not lost…you can still eat! Organic lychees ripening in the morning sun. The lychees in this week’s summer fruit offering come from Green Groves, not too far from Bee Heaven Farm. 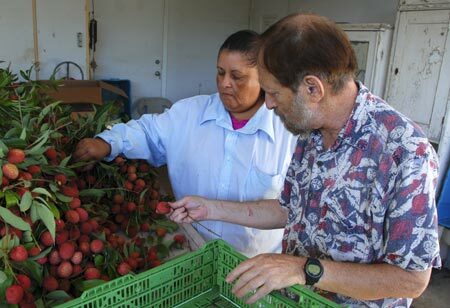 Steven Green, the grower, invited me to see how lychees get picked. He had an order from Whole Foods, and hired a picking crew to help. If you were in Whole Foods last weekend or this weekend and saw pint containers of organic lychees for sale, those were the ones! Up in the cherry picker, Gonzalo picks lychees. Picking work starts early. Golden morning sunlight was just breaking over the tops of trees from the grove across the road. The air was cool and full of sounds of birds. Dew was still clinging to weeds under the lychee trees. Ripening fruit hung in heavy clusters on the trees. At 7 am, the crew was already getting started. They had dropped off their cherry picker the day before. It was a simple contraption — an engine on three wheels, with a boom arm and bucket. Gonzalo, one of the workers, stood in the bucket and manipulated the controls to raise the boom and drive the picker to a different spot. When I arrived, he was already at tree top level gathering fruit. 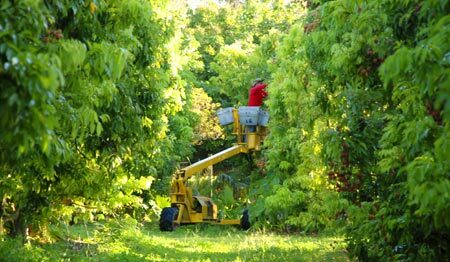 Gonzalo held a pair of heavy duty clippers in one hand, and reached with his other hand to grab clusters of lychees called panicles. He snipped the panicle and placed it into one of the bins fastened to the sides of the bucket. He started with the first tree by the gate, and worked from top down. Then he moved to the other side of the tree, gracefully maneuvering the picker, and again clipped fruit from the top down. “Usually the whole tree ripens at the same time. The lower branches ripen before the upper. And the top gets eaten by grackles,” Steven said with a laugh. 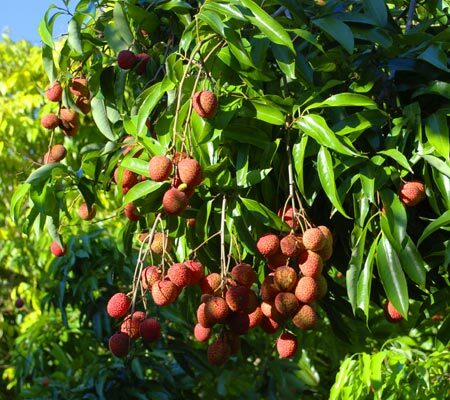 “I have enough to share.” He has 125 trees planted on two acres, and has been growing lychees since 1992, and avocados for 15 years before then. 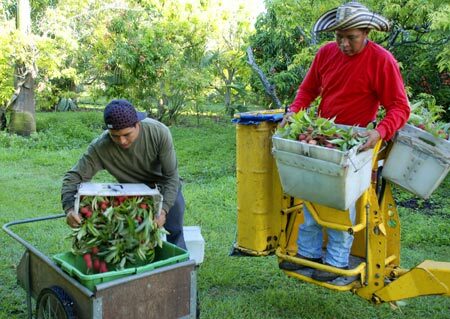 Hidalgo loads fruit that Gonzalo gathered. The rising morning sun shone on Gonzalo’s face as he worked silently and quickly. Bins filled up with lychees. The picker’s gasoline engine clattered, and grackles screeched from a nearby tree. He lowered the bucket and Hidalgo came with a gardener’s cart and dumped lychees into it. When the cart was full, he walked back with the cart to the improvised packing house. A long table had been set in the carport of Steven’s house. Hidalgo dumped lychees onto the table. It had a raised lip along the edges, to keep precious fruit from rolling away. Steven shows Leticia the acceptabe size for coffee spots. 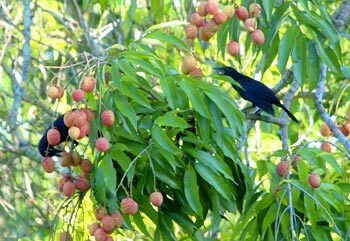 The sweet perfume of ripe lychees filled the air. Steven showed me the difference between a perfectly ripe lychee and one that wasn’t quite there. The not as ripe fruit’s skin had little spines or bumps. A ripe fruit’s bumps flattened out. Steven explained that as it ripened, the lychee grew more plump and rounded, which stretched its skin and flattened out the bumps. Hidalgo, Gonzalo, Betty, Steven and Shelly grading and packing fruit. A case of organic lychees destined for Whole Foods. Steven showed me the label that went on each pint clamshell and cardboard case. Among other information, the label had the “Redland Raised Fresh From Florida” logo and the grove’s organic certification number. 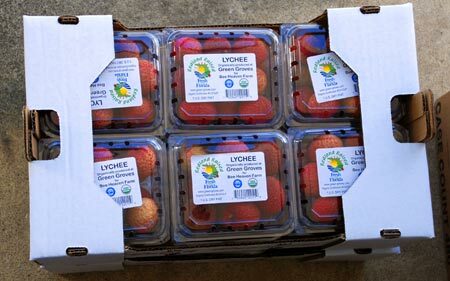 Shelly stuck labels onto pint sized plastic clamshell containers, then filled one container at a time with number one lychees, and packed 12 to a case. Steven put labels on the cases. The crew would pick and pack fruit for a few more hours. A driver was coming later that afternoon to pick up their order of 40 cases. Steve’s lychees would be in local stores for the weekend selling for $6.99 a pint. Look carefully and you’ll see a pair of common grackles feasting on fruit. On my way back into town, I passed by a woman selling lychees by the side of Krome Avenue. It was completely the opposite of a supermarket — a tent, a bin full of lychees, and an ancient looking scale. Three cars had pulled to the side of the road and people were handing her cash for pounds of sweet fruit. Hand lettered signs nearby said LEECHEES $2.00. For that price, most likely the lychees were grown locally and were not organic. 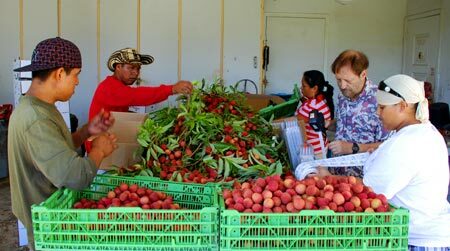 I was reminded of something I heard a farmer once tell me: “Growers are price takers, not price makers.” On that sunny Thursday morning deep in the heart of Redland, two kinds of lychees were being sold, and two kinds of prices were being made.